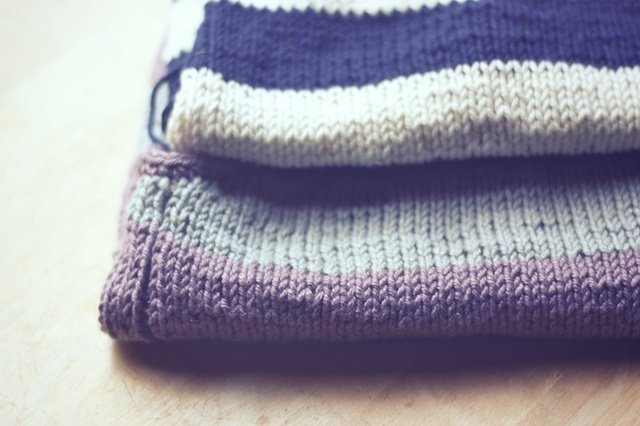 "Really all you need to become a good knitter are wool, needles, hands, and slightly below-average intelligence." ".. what's the sense in planning ahead, unless you have to?" "...contrary to superstition, a dropped stitch does not immediately zoom down to the bottom of your work like a run in a stocking. At the most it will slither down one or two rows, and cling there, moaning piteously, and waiting to be picked up..."
Those are a few quotes I've enjoyed from Elizabeth Zimmerman's Knitting Without Tears. 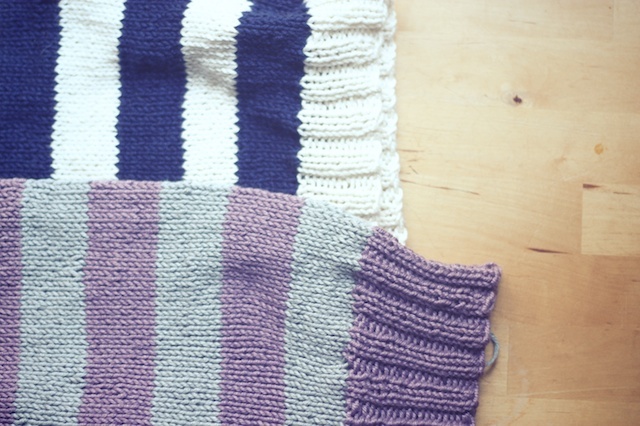 I'm so enjoying the Knitting Classics Read-A-Long in the Canary Knits Ravelry group. I'm only through the first chapter (which is like a third of the book) and I've learned much. I first started this book when I was a fairly new knitter. I don't know if I'd even knitted a sweater at that point, so I was not super confident. I approached Elizabeth's methods like a pupil would their Sensei's. It was "Whatever you say, Master." There was an aura of mysticism about her inventive techniques. How she would split wool if she had to to get the right weight, or how she would introduce a pattern to a border to hide a color change. I couldn't imagine a time where all of those cast-offs and button holes would even read as logical to me, much less a time where I'd try them. 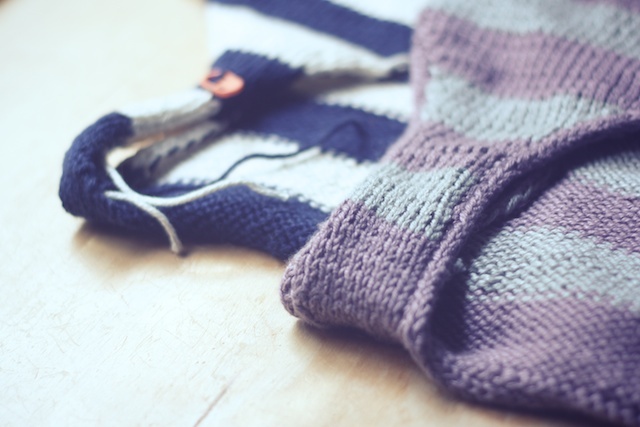 I was a little afraid of my knitting then- afraid to alter a design to work better for me and afraid I would make a mistake. If I did screw up, I was afraid to rip back or compensate in some other way. I'd just rip back completely and start over. Those various stitch combinations hanging from the needle were some mysterious alchemy that might instantly disappear if I blinked my eyes wrong... or sneezed. It was like holding the Shroud of Turin, or something. I only read about halfway through Knitting Without Tears and then abandoned the book to go try some of the things I was reading. But like any good friend, she waited for me. Today, as I read this book, I realize I am now familiar with many of these techniques. Some of them I learned without knowing Elizabeth was the one who invented them. I'm still gleaning all that I can from her thoughts on knitting, but my perspective is closer to that of a peer these days. I get some of her jokes and share opinions that I might not have when I first began. Her style feels so familiar. I'm also not afraid to try crazy things like snipping stitches to add pockets or buttonholes if I want to. I don't know if I'll ever do it, but it's nice to know I can if I feel like it. I suppose it's just years of experience that brings me to a place in my knitting where I don't rip back to fix a mistake if I don't feel like it, or where I'll change the design up to compensate for a yarn shortage, rather than ordering more yarn. These are all strategies she discusses and encourages timid knitters to try "to prove to you that you are the absolute boss of your knitting." I gotta say, I'm not feeling too boss in the rest of my life, so it's nice to rule somewhere. So here's me being boss: the Aquae tank top by Hilary Smith Callis. I began the tank and decided I didn't want waist shaping. Then, I decided I'd like it to be cropped. Then, I decided to make the ribbing 1x1, which I later changed to 2x2 and doubled the number of rounds in ribbing. I tried the ribbed neckline and armholes, but decided to follow another knitter's lead and do I-Cord bind off (I think Elizabeth would approve, as she invented it.) for all of those edgings. The result was a sweater that felt completely my own. It only took a few days, so I thought, "Why not use the leftovers from my Oud tank and make another in navy and off-white?" Things didn't pan out. I ran short of the navy, then the white. Did I panic? Did I place a midnight yarn order? Did I rip it back to re-knit with some extra color I didn't really like? Nope. 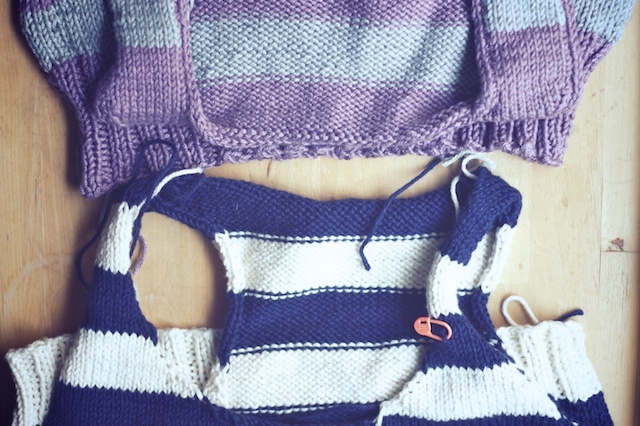 I just let it be a truly cropped top, with the recommended amount of ribbing. I didn't even bother with edgings for the arms and necks, just left it raw like on a t-shirt. And it's really okay with me. It will serve just fine for our insanely hot summers and it looks a whole lot better than ripped t-shirt tutorials on Pinterest. Elizabeth might just be proud of me.